Precious metals markets enter the last trading week before Christmas near multi-month lows. Gold and silver succumbed to another round of selling last Thursday following the Federal Reserve’s rate hike announcement. Bulls are hoping for a Santa Claus rally to take metals into year’s end on a positive note. Bears say “bah humbug” and will aim to keep the intense selling pressure on in the futures markets. 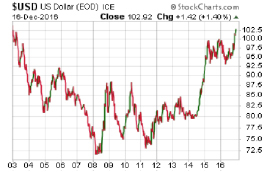 The U.S. Dollar Index now trades at a 14-year high. It looks impressive – until you consider all the other currencies that trade against the dollar. Dollar “strength” is really just an expression of the fact that other currencies are weak. The strong dollar isn’t real, and neither are the Federal Reserve’s rate hikes. Yes, Fed policymakers did just bump up their benchmark rate by a quarter of a percent. But the Fed’s two measly moves over the past year have NOT raised short-term interest rates above the inflation rate. Therefore, rates remain negative in real terms, which is bullish for precious metals. Even if Janet Yellen pushes through three rate increases in 2017, as she now suggests she will, the result will still be an interest rate that sits below the Fed’s own 2017 inflation projection of 1.8%.